Building a gorgeous sunroom can be a wonderful way to beautify the property you own while enhancing the value of your home investment. While there are many different types of sunroom additions to choose from, like solariums, screen enclosures, and three season sunrooms, four season sunrooms are widely considered to be the most superior construction. This is because four season sunrooms are built with insulated windows, and can be heated and cooled for continual use throughout the year. At C-Thru Sunrooms, we’re proud to offer custom-designed, four season sunrooms for homeowners that want to upgrade their homes dramatically. Whether you’re hoping for a traditional look or something that more closely reflects your home’s modern or unique style, our sunroom experts can create and construct the perfect sunroom addition to suit your décor preferences and your budget. In this article, our experts will provide more information on what four season sunroom additions are, and how you can benefit from building a custom-designed one for your home. What are Four Season Sunrooms? Four season sunroom additions are a type of sunroom with floor-to-ceiling glass. These constructions are built onto the side of a home, providing an unobstructed view of your outdoors while protecting the inside from the external elements like rain, snow, sun, wind, and insects. Because this type of sunroom addition is weatherproof, with custom-engineered roof and frames that provide insulation, four season sunrooms can be heated with your HVAC system. This means that unlike other types of sunrooms, four season models are made to be enjoyed throughout the year. As we mentioned before, four season sunrooms are generally preferred by most homeowners because the space can be enjoyed all year long. Whether temperatures are frigid cold or scorching hot, the beautiful view of the outdoors can still be enjoyed at the comfort of your four season sunroom. More Living Space: This can provide additional functional space that you can use as a living area, indoor garden, study, family room, among other things. Greater Energy-Efficiency: Materials provide quality insulation which improves your home’s energy efficiency. Enhanced Value: A four-season sunroom can increase the value of your property in case you plan to sell it in the future. Customization: You will be in control of the style as four season sunroom additions are usually fully customizable, from the roof to windows. Natural Light: If you love natural light, sunroom additions are a great investment because the glass walls and ceiling will allow the maximum level of natural light to enter. Outdoor Views: You can enjoy the beauty and serenity of your outdoors, 365 days a year—without worrying about the weather, insects, and other elements. 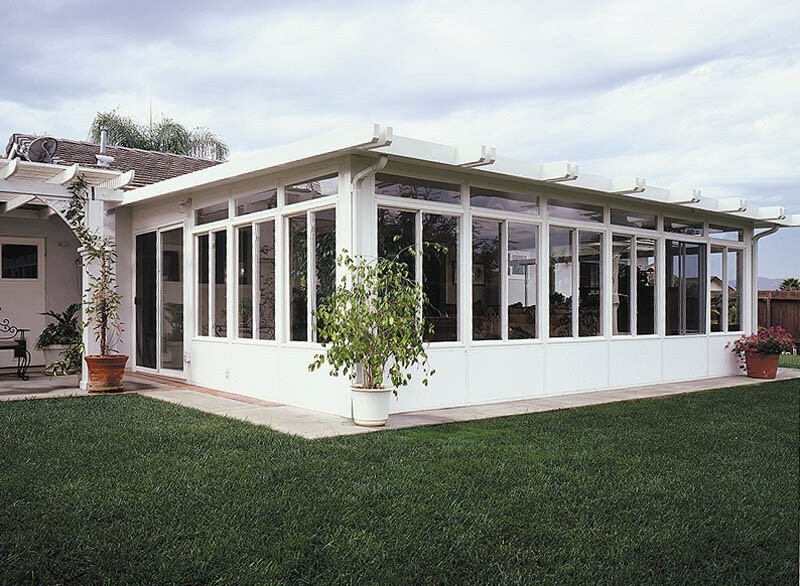 Since 1947, C-Thru Sunrooms has been an industry leader in the design, manufacturing, and custom installation of beautiful, high-quality sunroom constructions. We take pride in our work, and go above and beyond to make sure that each custom sunroom addition is built exactly the way our customers want. We offer a wide range of design and functionality options for your sunroom construction—from roof and ceiling styles, window and door options, solid and glass walls, and so much more. Plus, you can be sure that our products are manufactured from the highest quality materials and installed by industry experts in a timely manner. To learn more about our services and the different types of sunrooms that we offer at C-Thru Sunrooms, give us a call to speak with an agent. You can also fill out our online form, and we’ll send you information on how to get a free, in-home pricing estimate for your custom sunroom construction.